This chapter addressed the following background issues: evidence-based medicine, the empirically supported treatment debate, what constitutes evidence, and competency. The National Council of Schools and Programs in Professional Psychology (NCSPP) educational model was discussed including the following components: relationship, assessment, intervention, consultation and education, management and supervision plus research and evaluation. Six specific foundational competencies were considered including their essential components, behavioral anchors, and assessment methods that indicate readiness for practicum, internship, and practice. 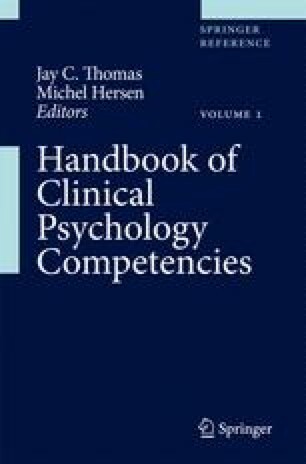 These foundational competencies include: reflective practice and self-assessment, scientific knowledge and methods, relationships, individual and cultural diversity, knowledge of ethical and legal standards and policies and interdisciplinary systems. The following six functional competencies were discussed: assessment-diagnosis-case conceptualization, intervention, consultation, research and evaluation, supervision and teaching, plus management and administration. Essential components with behavioral anchors and assessment methods that indicate readiness for practicum, internship, and practice were identified. What being expert entails was briefly discussed.